President Trump’s proposed 2019 budget cuts funding for HIV research and prevention, puts other healthcare funding at risk. On February 12, 2018, President Trump released his proposed budget for the upcoming fiscal year. 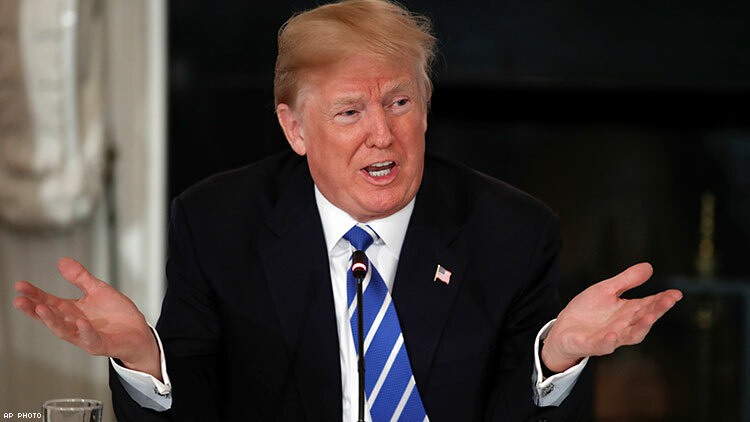 The $4.4 trillion budget proposal is unlikely to be enacted by Congress as is, but it does show where President Trump’s priorities lie, with large funding increases to the military and steep cuts to federal programs such as Medicare and Medicaid. Unfortunately, Trump’s budget indicates that domestic and global HIV research, prevention, and treatment programs are also low on his list of priorities. Trump’s FY19 proposed budget completely eliminates funding for the AIDS Education and Training Centers (AETCs) and Special Projects of National Significance (SPNS), which are both programs run under the auspices of the Ryan White HIV/AIDS Program. AETCs and SPNS projects are vitally important for pioneering, evaluating, and implementing innovative HIV care models for vulnerable populations that are disproportionately burdened by HIV, including transgender women and gay men, particularly transgender women and gay men of color. The AETCs also assist with rapid response to outbreaks of disease. When nearly 200 people were diagnosed with HIV in rural Scott County, Indiana over a 15-month period in 2014-15, the Midwest AIDS Education and Training Centers provided in-depth training to doctors and care providers in the area and helped get those newly diagnosed with HIV into immediate care. Ironically, Vice President Mike Pence was governor of Indiana during the HIV outbreak and is now part of the administration that proposes to defund programs that were vital to responding to the Indiana HIV crisis. Trump’s FY19 budget also proposes significant cuts in funding ($35 million) for domestic HIV/AIDS research and prevention efforts run by the U.S. Centers for Disease Control and Prevention (CDC). Although rates of new HIV infections have dropped by 20 percent overall in the past decade, they have increased sharply among Black gay and bisexual men and Black transgender women. Cuts to CDC funding would undermine efforts to reduce disparities experienced by vulnerable populations and threaten the progress that has been made since the implementation of the National HIV/AIDS Strategy. The budget also seeks to cut funding for the Housing Opportunities for Persons with AIDS (HOPWA) program run through the Department of Housing and Urban Development. HOPWA gives grants to states, nonprofit organizations, and local communities to fund projects that help low-income people living with HIV find and maintain affordable housing. Lack of access to stable housing acts as a barrier to adhering to HIV treatment regimens, which is necessary to achieve viral suppression. In addition to funding cuts for domestic HIV programs, the budget also recommends cutting U.S. global HIV/AIDS programs by $1 billion. These funding cuts would affect USAID, CDC global HIV programs, the Global Fund to Fight AIDS, Tuberculosis, and Malaria, and PEPFAR (President’s Emergency Plan for AIDS Relief), which could result in an estimated one million people dying prematurely of AIDS. The majority of the U.S. government’s global HIV/AIDS efforts are focused in sub-Saharan Africa, which would be disproportionately burdened by the proposed budget cuts. The proposed budget would also eliminate Medicaid expansion. While not directly related to HIV, Medicaid expansion played a major role in expanding access to insurance for people living with HIV. In states that have expanded Medicaid, people living with HIV could qualify based on income alone, rather than also needing dependent children or an AIDS diagnosis to qualify. The CDC and the Kaiser Family Foundation estimate that following implementation of key elements of health care reform, the percentage of people living with HIV who lacked any kind of health insurance coverage dropped from 22 percent in 2012 to 15 percent in 2014. The percentage of people living with HIV who received their health insurance through Medicaid increased from 36 percent in 2012 to 42 percent in 2014. Lastly, Trump’s FY19 budget would shift a significant amount of funding for various programs from mandatory funding to discretionary funding, which would make the programs vulnerable to even more budget cuts in the future. For example, $3.6 billion in funding for community health centers would be shifted from mandatory funding to discretionary funding under the proposed budget. Community health centers serve some of the country’s most vulnerable populations, including LGBT people, people of color, people with low incomes, and people living with HIV. This budget symbolizes a radical rejection of the social compact that has sustained our country for half a century. It would undermine important progress we have made in preventing and treating HIV in the United States and across the globe. It casts the most vulnerable people aside and leaves them to fend for themselves without the resources they need to be able to achieve the same standards of health and well-being that many take for granted. Tim Wang, MPH, is LGBT Health Policy Analyst for The Fenway Institute at Fenway Health. Sean Cahill, PhD, is Director of Health Policy Research for The Fenway Institute at Fenway Health.